Saturday’s ‘drop in’ session with Transition Haverfordwest was open to everyone and had an environmental and sustainable theme . It was well attended and lots of ideas emerged in a constructive and lively debate around the table. We wrote/drew and plotted these on the Map. Community Energy: what opportunities are there in Haverfordwest? People and traffic: how can we share space and reduce pollution? Adopt the French system for protected parking, with priority single traffic flow in narrow two way streets to avoid one-way systems. A surfing weir – like Munich’s? (Sited downstream at Picton playing fields). Reduce through traffic by stopping the ‘short-cut’ through town. Allow buses and ‘access only’ in Victoria place/Castle Square and High Street. A river lock downstream for boats -flood area below the weir for recreation and boating. Generate Hydro-Power from water passing through the new lock. A debate around the current planning system of decision-making based on inflexible use-categories and development planning policies led to an interesting proposal for Haverfordwest. 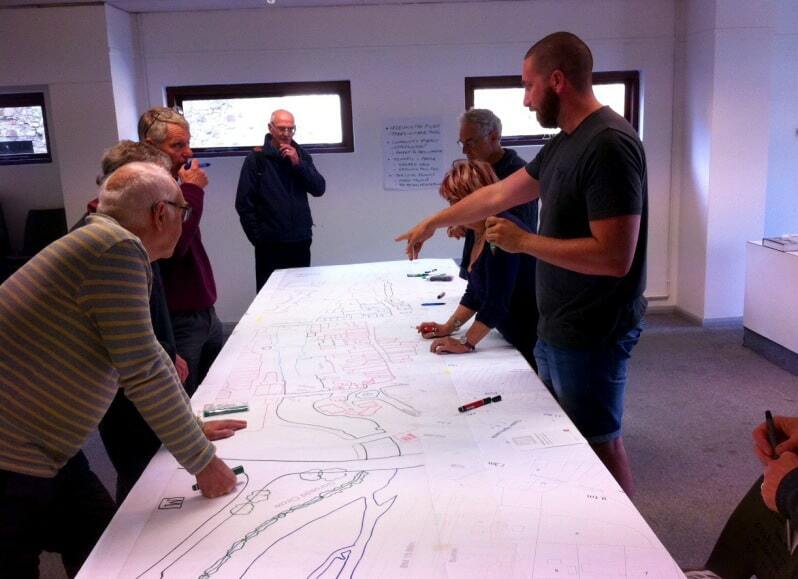 Why not create a people’s map that itself becomes a planning document for consultation? Could this be part of, or adopted, within the master-planning report for Haverfordwest? This is currently being undertaken by planning consultants Nathaniel Lichfield for Pembrokeshire County Council. We have the opportunity to explore this further when we meet Sarah Goy, Senior urban designer at Nathaniel Lichfield in our last session of the month on Friday 25th September.